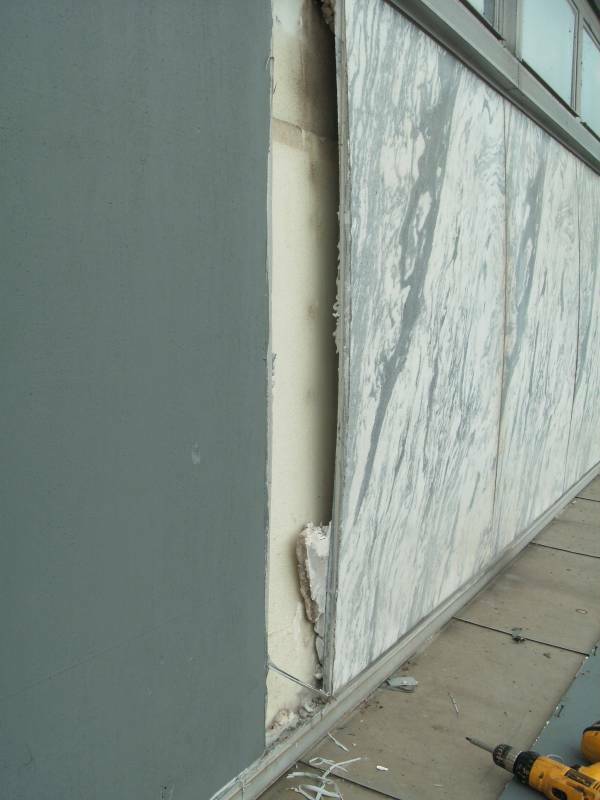 Problems with marble cladding can include bowing, expansion, loss of strength, cracking and even detachment from the building. Here we will address the cause and solution to hysteresis and marble facade failure. If you are involved with a stone cladding or facade project that needs restoration or you are an architect, engineer, owner or contractor tasked with designing or constructing a stone cladding project, you want to avoid problems. Several prominent buildings have suffered from the problem of marble facade failure, including the Amoco building in Chicago, the Finlandia City Hall in Helsinki, La Grande Arch and SCOR Tower in Paris and IBM Tower in Brussels. So Why Do Some Marble Facades Bow and Warp? Natural stone has been used for facade applications for centuries. But until relatively recently, the marble was always heavy 4″ to 8″ thick slabs. These stone panels did not bow, but they also placed considerable weight on the building. In the late 1950’s, the slab thickness was reduced to 1 1/2″ or so. This reduced the weight of the stone cladding, but introduced some new problems. One of these problems was slab bowing. Over time the facade slabs can bow to be either convex or concave. The attachment of the slabs, by kerf cuts and slots, tended to rely on the weakest property of the stone for attachment. The greatest amount of bowing is on south facing facades. Here the sun tends to cycle the stone cladding through greater temperature swings. 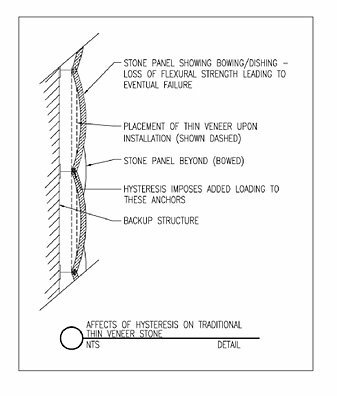 What stones fail, bow and crack in facades and cladding applications? The marbles most susceptible to bowing are white marbles. These include Italian Carrara marble, but also marbles from Greece, Italy, Portugal, Spain, Norway, China and USA. Marbles of the same variety, from the same quarry, can have a different propensity to bowing. Limestone facade panels generally do not bow, but may expand out of their anchors. The problem with marble facades is not limited to one climate or one type of marble. In the USA, buildings in several states have had problems. In Europe, there are building facades with bowed marble slabs from both the cooler climates of Finland and Denmark to the warmer climates of Portugal and Spain. Bowed slabs occur in Austria, Belgium, France, Germany, Greece, Italy, Netherlands, Norway, Sweden, Switzerland and United Kingdom. Why does the marble bow? Certain marble slabs permanently warp in response to uneven heating and cooling and a moisture variation in the stone. Each day, the sun heats the panel face causing it to dry out and to expand more than the back of the slab. The inside face of the panel (against the building) remains cooler and more moist. When the crystals within some marbles expand, they do not return all the way back to their original size when cooled. The result is a gradual bowing or cupping of the stone facade panel with each heating/cooling and damp/dry cycle. In addition to the change in shape, the process weakens the stone. In laboratory testing some 80 different marbles we have found the main external cause of bowing to be uneven solar heating with a moisture gradient. Various marble types respond in different ways to the cycles. This mostly depends upon the microscopic crystal patterns within a marble and how the grains are “locked” together. One solution is to use StonePly instead of slab marble. StonePly combines a thin 1/4″ layer of natural stone bonded to aluminum honeycomb backing. The StonePly panel relies on the aluminum honeycomb for strength and rigidity, not on the stone. Testing has proven that StonePly panels do not suffer the same thermal hysteresis problem as slab stone. 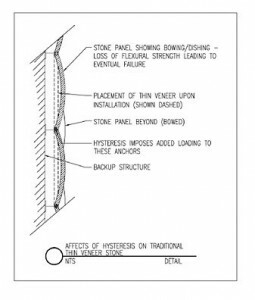 StonePly has been tested using the European procedure for testing stone slab bowing. 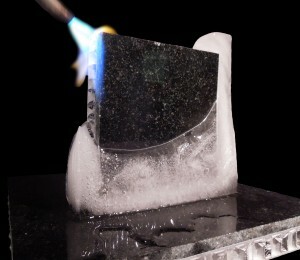 In the test, the slab is partially submerged in water. The un-submerged face of the slab is exposed to radiant heat. The slab is subjected to repeated cycle of heating and cooling. In testing, 40 cycles are considered sufficient to show if the marble has a tendency to bow. After 200 cycles, the StonePly shows no discernible bowing or warping. For more information on StonePly panels please contact us at 903-454-4630.